Whether you need that unparalleled sound at home, in the studio or for live performance, the Yamaha CLP-635 will not let you down. Yamaha have worked extremely hard to give you a digital piano that looks, sounds and feels as real as a grand piano thanks to new and improved modelling technology. 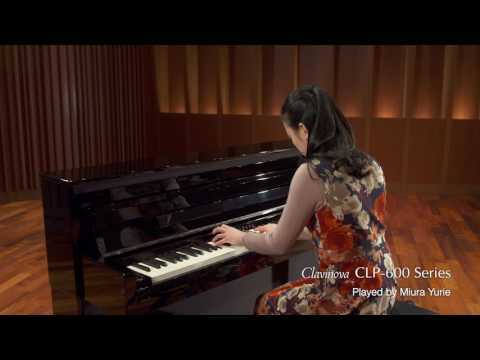 The Yamaha CLP-625 Clavinova Digital Piano comes loaded with a total of 19 high quality voice demo songs, 50 piano songs, 303 lesson songs and 20 rhythms. This is an advantage of having a digital piano as it gives you a plethora of effects to experiment with. A digital piano allows you to tweak your volume should you need to, and this is a great feature to have on the CLP-635. You can lower your volume to practice quietly at home without causing a disturbance. This is further improved by two headphone sockets, so you can practice alone or with a friend or teacher simultaneously, all in total silence. Yamaha have integrated advanced binaural sampling for the first time in this Clavinova model, so after a little while you will forget that you are wearing headphones due to the sheer sound quality.